It was originally my intention to cover heat treatment here, but I quickly realized that the level of detail I wished to achieve made combining the prerequisite information with those processes nothing short of cumbersome. So, the ultimate purpose of this exploration of knowledge must once again wait for a future post. Until then, below is a brief summary of those topics. Steel, or more specifically Iron, has the ability to take on various arrangements in its metallic lattice structure (as a solid), which are called allotropes. When pure iron is alloyed with other elements (namely carbon, amongst others), the amount of those elements changes the material properties of the alloy, and as a result, the temperature at which the allotropes exist. Those temperatures will be specific to each alloy (which includes the percentage of alloyed elements). There are seven atomic crystal systems, although iron exists only in the Cubic system. Each of the seven systems have multiple variations depending on the non-corner nuclei, which define the geometry. This principle is important for the phases of steel. The seven systems are, for only the point of distinction, summarized below. -Triclinic- Each length of the sides is exclusively different, and the angles between lengths are also exclusively unequal. -Monoclinic- A prism where the ends are two parallelograms, where the angles of the non-parallelogram faces are 90 (perfect rectangles). -Orthorhombic- A rectangular prism where the faces have side-pairs of exclusively unequal lengths, resulting in three orthogonal pairs of parallel sides. (None of the faces are squares, but are all rectangles). The Cementite phase of steel exists in this form. -Tetragonal- The two end faces are square and parallel, resulting in the four side faces being equal rectangles. The martensitic phase of steel forms a body centred tetragonal lattice. -Hexagonal- A hexagonal prism with the ends being regular hexagons. An additional nucleus rests in the centre of each hexagonal face. -Trigonal- A system which is composed of a rhombus superimposed with an extruded regular hexagon, called a rhombohedron. Cubic Crystal System- This is the important system for the context of steel. 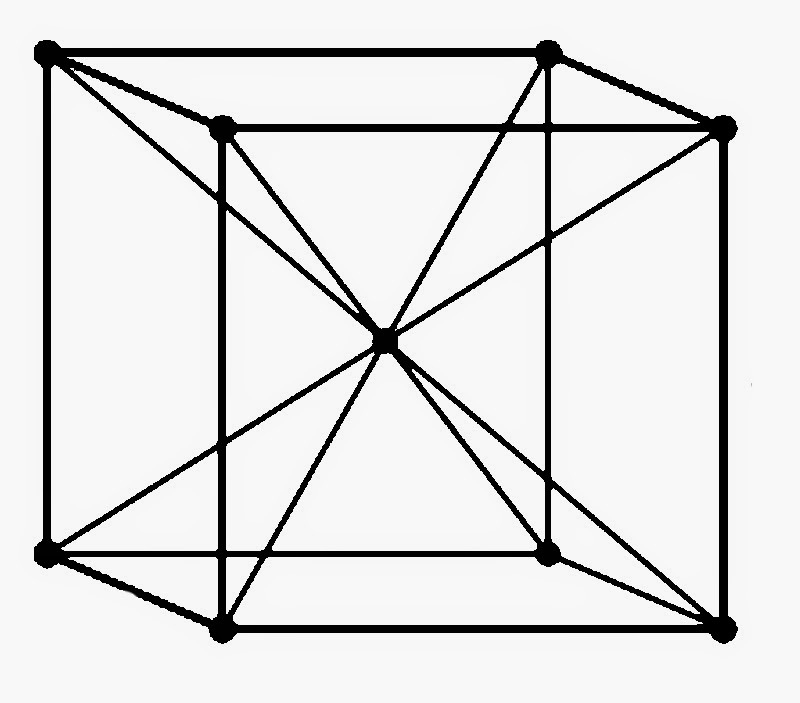 The unit cell is an isometric lattice, meaning each side is of equal length and adjoining angle (perfect cube). There are three variations of the cubic system, of which the later two are found in steel. 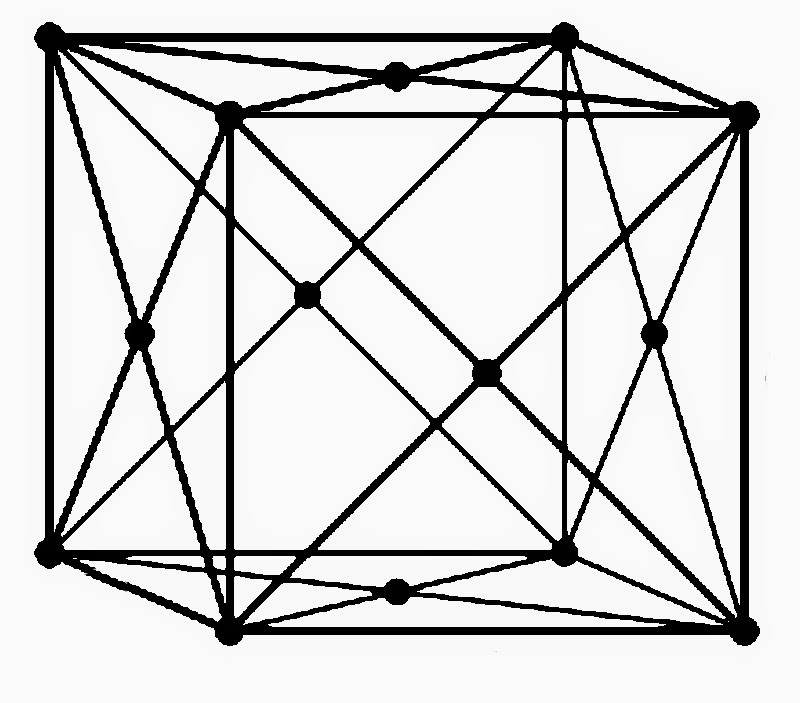 Primitive- Only the eight corner nuclei exist in the structure. It is the simplest of the cubic crystals. Body Centred Cubic- (cB, or bcc) A ninth nucleus rests in the centre of the eight corners. This is the predominant stable form of iron at room temperature (more will be discussed later). Due to the packing of the nuclei in this fashion, the cB unit cell has a relatively small packing factor of .68 (a measure of how tightly spheres are packed in a space, with 1 (impossible) being 100% of the space). In steel, different phases may transition to body centred tetragonal (as martensite), which is similar to cB excepting that one dimension is stretched to form a rectangle, while the angles and remaining two dimensions are unchanged. Face Centred Cubic- (cF, or fcc) In addition to the eight corner nuclei, there is an additional one in each of the centre of each face (but not centre of the entire cube), for a total of fourteen nuclei. Because the atom volume is constant between cells, the atoms in a cF cell are more tightly packed. This arrangement yields a packing factor of .74048 (which is the theoretical maximum for any sphere packing orientation). Because the atoms are so tightly packed, the cF cell is the most dense, which means it also occupies a smaller volume than the same number of atoms in a cB lattice cell. Iron in this form is called Austenite. Along with molecular geometry, steel exists in various phases depending on its temperature. These allotropes are significant when it comes to heat treatment and the forging of steel. Temperatures at which these transitions occur (assuming no change in pressure) is dependent on the alloy of the particular grade of steel. Delta Iron- (δ-Fe) When pure (elemental) liquid iron solidifies, which is approximately 1,540 °C (2,800 °F), this is the first form it takes. The molecular geometry is a cB lattice, and it remains in this form until cooing an additional 144 °C. Gamma Iron- (γ-Fe) After reaching 1,394 °C, the iron becomes austenitic, meaning it transitions to a face centred cubic lattice, which is more closely packed than the body centred lattice and thus reduces in volume slightly (~8%). γ-Fe is capable of dissolving over 2% more carbon than other, lower temperature phases of iron. Alpha Iron- (α-Fe) Below 912 °C (1,674 °F), pure iron transitions back to a cB lattice structure. If pure α-Fe exists in this form, it is also called Ferrite. α-Fe saturation for carbon is only .021% by weight, which is significantly lower than the previously mentioned γ-Fe. Depending on the temperature, Alpha Iron can exist in two forms, depending on its magnetic properties. Below the Curie Temperature (Tc), the temperature at which the metal transitions between being paramagnetic and ferromagnetic, the iron is considered only to be α-Fe. For pure iron, this temperature is 770 °C (1,418 °F), and below which the Ferrite is ferromagnetic, meaning it will respond to a magnetic field. Beta Iron- (β-Fe ) Above Tc but below the phase transition to Ferrite, the lattice (still body centred cubic), becomes paramagnetic. Beta Iron is identical to Alpha Iron excepting this difference. Due to the loss of magnetic response above the Curie Temperature, it is often used as a reference for simple high carbon steels during heat treatment. However, the difference (in pure iron, which decreases in eutectic steels) is still 142 °C (256 °F), which is fairly significant given the impossibility of hardening below the cB/cF transition. To alloy steel, additional elements must be introduced to the lattice. Because the distance between lattice points (centres spheres that represent the entirety of the atom which occupies that space) is dependent on the atoms that form the lattice, introduction of other atoms will change the crystal structure around that flaw. Several types of point defects exist within the crystal lattice, where two general types of involve the introduction of non-lattice elements. How the lattice is effected by the defects will determine many of the material properties in addition to what the particular atom is that causes that defect. Defects by definition do not change the classification of the parent crystal lattice system. It is also worth mentioning that a metallic alloy, rather than a specific repeated molecule like SiO2 in quartz which has a tetragonal base crystal lattice, there no base lattices that uniformly include all of the elements found within it. However, in certain situations, such as in steel, there can be centralized lattices between some of the alloyed elements (namely in the iron-carbon system, while the additional alloyed elements remain substitutional or interstitial defects). Vacancies- A type of lattice defect that exists in all lattices, whether or not there is a non-base atom introduced. This is a hole in the lattice where a lattice point would regularly have an atom reside. Because these defects always exist, all ductile metallic lattices can be work hardened, meaning the mechanical deformation of the lattice which results in the pinning of these defects in positions which require high amounts of energy to move. Substitutional- Point defects where a single lattice point of a uniform lattice is replaced with another element. In the case of steel, this will not replace iron with carbon, instead being additional alloyed elements such as vanadium or chromium. 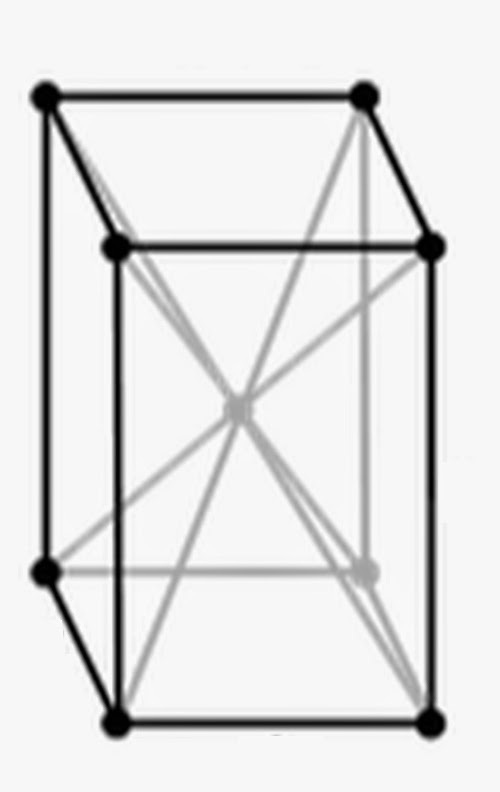 Depending on the relative size of the substituted element, the lattice will undertake compressive and tensile stress to accommodate the difference. The immediate neighbours of the substitutional point defect will experience the largest stress, while those farther out will experience little change. Interstitial- Point defects where additional lattice points are introduced between the normal points. In steel formed with ferrite, carbon is an interstitial defect, and occupies a space approximately twice the equivalent spherical volume of the interstitial holes present in the carbon, which introduces a large amount of stress to the structure and why the maximum dissolved carbon content is .021%. Pinning of dislocations, whether vacancies, substitutions, or interstitial defects, will cause the material to become harder and more brittle, as the dislocations will require more energy to shift to an unpinned position. As a result, all metals which are capable of undertaking plastic deformation without failure are capable of work hardening. This also means that work hardening of a hardenable alloy of steel is distinctly different from the phase transformation which can harden it via quenching. Additionally, it should be noted that defects in steel will undergo diffusion, so alloy gradients will slowly equalize over time. At higher temperatures, this occurs more rapidly, as the defect atom (interstitial or substitutional) is given more energy to move out of the lattice position it occupies. Similarly, pinned defects will migrate to equilibrium within the material over time, again more rapidly at higher temperature, which may re-locate them from their pinned, dislocated position. A eutectic system is one in which two components at a given state (i.e. solid) can coexist at a certain temperature with their combined liquid form. For the purposes of explanation, [A] and [B] will be two constituent materials which, when both melted, form a homogeneous material [C]. If the ratio of [A] to [B] is too low, [A] will begin to precipitate out of the liquid solution before [B], meaning [A] and [C] will exist at the same time. However, if there is too much of material [B], then it too will solidify first, leaving [B] and [C] to coexist. Now, if the ratio of [A] and [B] is at the eutectic composition, then [A], [B], and [C] will all exist at the same critical, eutectic temperature. At that ratio, the material is said to be in a eutectic system. It should be noted that not all systems have a eutectic ratio, most notable a mixture of silver and gold (Electrum). When the phase of [C] is a solid instead of a liquid, but at some temperature a solid phase transition still occurs (of a crystal lattice), the material has a eutectoid temperature (as opposed to eutectic). This sort of system, which is illustrated above, exists for the forms of an iron/carbon mixture. At the eutectoid temperature 727 °C (1,341 °F) for the iron-carbon (Fe-C) system, Austenite, Ferrite, and Cementite all coexist simultaneously. For the Fe-C system, the eutectoid composition ratio is .76% Carbon by weight. Above the eutectoid temperature, Austenite (γ-Fe) exists, while below, a mixture of Ferrite (α-Fe) and Cementite forms. Should there be an excess of Ferrite, and thus iron, the steel will be a hypoeutectoid (below the eutectoid ratio); and if there is an excess of Cementite, and thus carbon, it will be a hypereutectoid. Importantly, if a system has both a eutectoid and eutectic temperature, which the Fe-C system does, those two temperatures are not necessarily the same (and are quite different for steel). A final note on eutectoids as they pertain to steel is that the presence of additional alloying elements changes the eutectoid ratio and temperature for that particular alloy. For example, Nickel and Chromium both lower the eutectoid ratio for carbon in steel. Before understanding the heat treatment process, it is important to examine the forms of steel as it exists within the crystal structure. There is a distinct difference between phases and microstructures, although the terminology common between them is often confused. Phases are a product of the intermolecular kinetic energy distribution, whereas microstructures are, as mentioned in the discussion of native and meteoric iron, a relative arrangement of macro-lattices (as opposed to the crystal system micro-lattices). Both the phase and microstructure can have dramatic effects on the working properties of the steel, whether ductility, hardness, brittleness, strength, reaction to strain, conductivity, magnetic reaction, amongst many others. 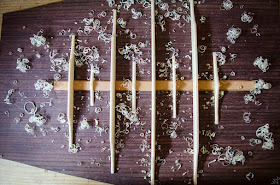 The following list is not meant to be all inclusive, but rather comprised of those relevant to bladesmithing. Ferrite- As aforementioned, ferrite is the cB crystal structure of pure iron. Ferrite does not exist as an alloy, although it can and often does exist in localized concentrations of iron based metals. When combined with other phase concentrations, ferrite can form certain microstructures. Maximum carbon content of .021% by weight. Austenite- Also mentioned above, γ-Fe is the cF, paramagnetic allotrope of iron that exists above 1,394 °C. This phase transition begins in pure iron at 912 °C where the first cB lattices change to cF, which, due to the change in atomic density, is able to dissolve approximately 2% more carbon. This is important when concerning heat treatment of steel and will be later discussed. Cementite- Iron Carbide (Fe3C), which is an orthorhombic base crystal lattice form. When combined with Ferrite, it commonly forms the Pearlite microstructure. 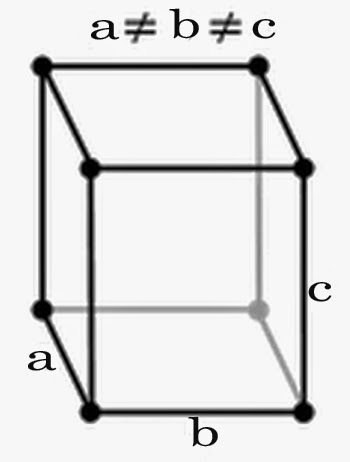 In the orthorhombic system in which the lengths of the sides are stretched from their cubic form (three side sets are all inequal length but intersect at right angles), carbon is more easily accommodated in the interstitial holes. As a result, the interstitial stress is less significant and the lattice can hold more carbon before becoming unstable. Cementite is, in its pure form, 6.67% carbon. As Austenite cools, carbon diffuses into pockets that form cementite to take in what the Ferrite cannot hold. Cementite is extremely hard and brittle (a ceramic if pure Fe3C). Martensite- When Austenite is cooled with sufficient speed (varies with the alloy of steel), instead of being converted back to ferrite and cementite, the carbon is trapped in the lattice and forms a body cantered tetragonal structure that is, in effect, a super saturated form of ferrite. Due to the excess carbon held here instead of in localized pockets as cementite, there is a comparatively high amount of internal stress due to these interstitial carbon atoms being pinned in the tetragonal lattice. This is where Martensite gains its hardness, as the pinned shear dislocations do not permit the movement of defects across the lattice. Martensite is approximately 1.75x harder than pearlite on the Brinell scale. Different alloys of steel have different hardenability depending on the carbon concentration, as that is the determining factor of how much of the lattice is held in the martensitic form rather than lesser concentrations of carbon which return instead to ferrite or cementite. Past the eutectoid point, larger amounts of cementite will precipitate due to the larger stable ratio of carbon to iron (Fe3C). Since Martensite is in a state unattainable in thermodynamic equilibrium, the introduction of thermal energy allows the Martensite lattice to convert back to cementite and ferrite due to the increased diffusion rate of dislocations. Of a lower density per lattice cell than Austenite, Martensitic conversion results in a volumetric expansion when formed. This mostly accounts for the curvature achieved through differential hardening of single edged blades and the warps and bends of thin cross sectional areas. Grains- All metals have grains. When cooled from a liquid state, imperfections in the metal called nucleation sites (non-alloying elements, foreign molecules, alloys of a higher melting temperature, etc.) are where crystalline lattices begin to grow. Since there is nothing that forces them to align in any particular fashion, the spatial orientation is random. The more energy that is transferred from the cooling metal to the growth of solid via metallic bonds, the larger the crystals grow outwards or, if the conditions are right, the growth at new nucleation sites. When the randomly oriented crystals meet, they form grain boundaries and stop growing. Since the crystal faces are not aligned, the bonds there will be weaker than inside the newly formed grains and of a higher stress. Because of this, the fewer the total number of grains and thus larger in size, the more ductile the material (as it will be more accepting of dislocation diffusion). Due to the stress concentrations of grain boundaries, materials tend to fail along those boundaries rather than through the grains themselves. Grain size and growth can be determined during many formative and heat treating processes, which will later be discussed in detail, whereas the shape of the grain boundaries is determined by other material properties (lamella, lenticular, spheroidic, acicular, etc.). Pearlite- Perhaps the most common microstructure of steel, a quasi-homogeneous combination of 88% Ferrite and 22% Cementite by weight. 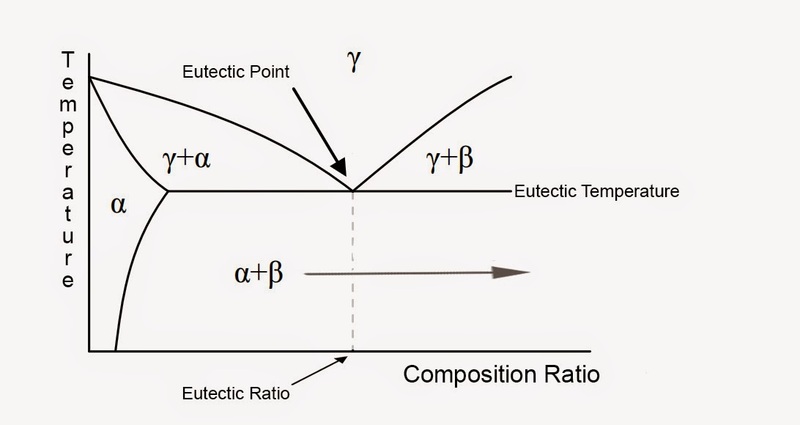 As shown in the above eutectic phase diagram, pearlite is formed by the cooling of Austenite below the critical temperature. In a given alloy, pearlite can exist along with cementite and ferrite, depending on the carbon concentration relative to the percent utilization by the pearlite (~1.5906% Carbon by weight). Within the pearlite complex, alternating layers of the carbon rich cementite and carbon deficient ferrite form a lamellar type microstructure (discussed previously with native iron). Bainite- Very similar to pearlite in that it is composed of ferrite and cementite. Bainite is formed from a more rapid cooling of austenite than when pearlite is formed, yet not so quickly that it instead converts to Martensite. However, instead of the lamella that pearlite grows, Bainite produces a radiating needle like patterns of ferrite clustered at a central nucleation point, called acicular crystals. Between the sheaves, cementite fills the voids, or in other phase transformations, Martensite or retained Austenite. Due to this structure, it is not as ductile as pearlite, although it is measurably harder. For this reason, and the fact that the tremendous internal stress of Martensite is not present, there is no need to temper or otherwise heat treat Bainite after its formation to retain its hardness. Widmanstätten Patterns- First introduced during the discussion of native and meteoric iron, Widmanstätten patterns are the product of iron-nickel crystal growth from the alternating layers of Taenite and Kamacite. The lamella meet at 60 degree angles and, due to the difference in diffusive properties between the iron and nickel, become easily visible on the surface. 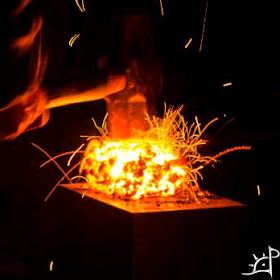 Beyond native and meteoric iron, these are relatively uncommon to metalworking. Tempered Martensite- In the formation of Martensite, the steel is subjected to a high internal stress. To relive that stress yet retain some of the hardness of the martensitic crystals, the material is tempered, allowing the decomposition of the body cantered tetragonal structure into a more stable form (cementite, ferrite, or together to become pearlite). While this process occurs, layers of Martensite form beside the other two phases of steel or beside pearlite. This forms, along with the intermediate microstructures, a final layered composition of lower internal stress while retaining hardness proportional to the temperature at which the martensitic steel was tempered (how much thermal energy was given to the steel determines the threshold for the energy required for a dislocation to be unpinned) and the time at which that temperature was held (unpinning of dislocations is a measure of probability, meaning longer times at that energy increases the chance for dislocations being freed at or below that energy also increases). In this sense, the degradation of Martensite is the result of the martensitic lattice, reaching thermodynamic equilibrium through the collapse of its structure into new, lower stress crystals.